Using the National Science Foundation's Very Large Array (VLA) radio telescope and helped by a gigantic cosmic lens conveniently provided by nature, an international team of astronomers has discovered that a young galaxy had a central disk of gas in which hundreds of new stars were being born every year -- at a time when the Universe was only a fraction of its current age. "This unique look into a very distant, young galaxy gives us unprecedented insight into the process that produced both tremendous numbers of stars and supermassive black holes in forming galaxies," said Chris Carilli, of the National Radio Astronomy Observatory (NRAO) in Socorro, NM, leader of the research team. "This work strongly supports the idea that the stars and the black holes formed simultaneously," he added. The research was published in the April 4 issue of Science Express. 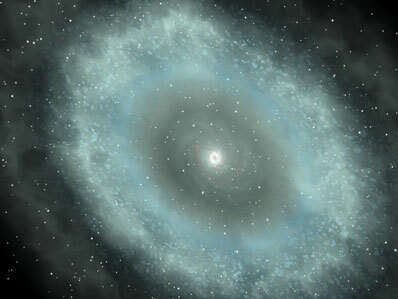 The astronomers studied a quasar called PSS J2322+1944, about 12 billion light-years from Earth. The quasar is an extremely luminous object powered by the supermassive black hole at the core of a galaxy. At the distance of this quasar, the scientists see the object as it was when the Universe was less than 2 billion years old, about 15 percent of its current age. The discovery required a huge assist from nature. To find the star-forming disk, the astronomers needed to observe natural radio emission from the carbon monoxide (CO) molecule, an important component of the gas that forms stars. However, this molecule emits radio waves at frequencies much higher than the VLA is capable of receiving. At PSS J2322+1944's distance of 12 billion light-years, however, the expansion of the Universe stretched the radio waves, reducing their frequency. CO emission at 230 GigaHertz was shifted to 45 GigaHertz, within the VLA's range. That alone was not enough. The distance that made it possible to receive the radio waves from the quasar also meant that the object was too far away for the VLA to discern the detail required to show the disk. Once again, nature stepped in to help, providing another galaxy directly between the quasar and Earth to form a gravitational lens. "What we needed wasn't just any old gravitational lens, but a nearly-perfect alignment of the distant quasar, mid-distance galaxy, and Earth -- and that's what we got," said Geraint Lewis of the University of Sydney in Australia, another member of the team. With such a perfect alignment, the quasar image was distorted into a ring, called an "Einstein Ring." The VLA images were the first to show the Einstein Ring of PSS J2322+1944. "We never would have seen the disk of CO gas near the center of this galaxy without the gravitational lens," said Carilli. "The lens boosted the signal and magnified the image to reveal the disk's structure in unprecedented detail," he added. For several years, astronomers have noted that the masses of black holes are directly proportional to the sizes of central bulges of stars in galaxies. This led to the speculation that formation of the black holes and of the stars are somehow related to each other. Scientists hypothesized that gas being drawn towards a galaxy's central black hole is the same gas from which large numbers of stars are forming. Studies of more-nearby galaxies supported such speculation, but the question remained whether the idea could be applied to the very early Universe, when the first galaxies and black holes formed. "This new observation gives strong support to the idea that large numbers of stars were forming in young galaxies at the same time that their central black holes were pulling in additional mass," said Pierre Cox, of the Institute for Space Astrophysics of the University of Paris. The astronomers believe that galaxies in the early Universe were frequently disrupted by nearby encounters with other galaxies, "feeding" the central black hole with gas. The gas formed an extensive, spinning disk around the galaxy's center, some of it eventually falling into the black hole and some of it forming new stars. In PSS J2322+1944, the astronomers believe that new stars with a total mass equal to some 900 times that of the Sun were forming in the 13,000-light-year-diameter disk every year. At that rate, the scientists say, most of the stars in a large elliptical galaxy could form in only about 100 million years. PSS J2322+1944 is one of the most luminous quasars in the Universe. It was first discovered by George Djorgovski of the California Institute of Technology (Caltech), using the digitized Palomar Observatory Sky Survey. Later studies led by Cox and Alain Omont of the Astrophysical Institute of Paris using the IRAM millimeter-wave facilities in Europe (the 30-meter telescope and the Plateau de Bure Interferometer) showed that it had a huge reservoir of dust and molecular gas, the fuel for star formation. Optical observation at the W.M. Keck Observatory in Hawaii showed a double image that indicated gravitational lensing. All these factors, the scientists said, made it an ideal candidate for study with the VLA. "Our guess paid off handsomely. Finding that Einstein Ring with the VLA gave us the tool we needed to see what was going on inside that very distant galaxy," said Carilli. "There are fewer than 100 gravitational lenses known so far, and we were extremely lucky to find one that allowed us to help resolve the specific scientific question we were studying." Gravitational lenses were predicted, based on Albert Einstein's General Theory of Relativity, in 1919. Einstein himself showed in 1936 that a perfectly-aligned gravitational lens would produce a circular image, but felt that the chances of actually observing such an object were nearly zero. The first gravitational lens was discovered in 1979, and the first Einstein Ring was discovered by researchers using the VLA in 1987. PSS J2322+1944 is the first Einstein Ring detected through the signature emission of a molecule and the most distant yet found. PSS J2322+1944 may be able to make another contribution to science. Astronomers believe that gravitational lenses may serve as a tool for precisely measuring great distances in the Universe. If a distant quasar varies in brightness over time, the multiple images formed by a gravitational lens would show that variation at different times. By monitoring such time differences and using a mathematical model of the specific gravitational lens, the distance to the quasar can be measured. "This quasar, if it shows brightness variations in the future, may be such a 'Golden Lens,' long sought to refine our measurement of very great distances," said Lewis. In addition to Carilli, Lewis, Djorgovski, Cox and Omont, the research team includes Ashish Mahabal of Caltech and Frank Bertoldi of the Max-Planck Institute for Radio Astronomy in Bonn, Germany.